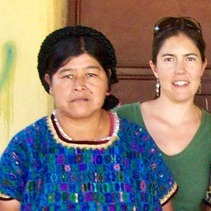 Heidi McKinnon (Association for the Integral Development of the Victims of Violence in the Verapaces, Maya Achí - ADIVIMA): Heidi holds a BA in anthropology and Spanish from the University of New Mexico and has worked with indigenous communities throughout Latin America since1997. Heidi worked at Smithsonian's National Museum of the American Indian (NMAI) in the late 1990s. Heidi researched human rights and sovereignty issues in every region of Latin America as she was developing content for the permanent exhibits at NMAI. Her research led her to ADIVIMA and the Chixoy Dam, which she recommended for inclusion at the Museum. A young woman entered the emergency room Tuesday with a bandaged arm. A machete wound. May 29th was the 30th anniversary of a massacre that occurred in Panzós, Alta Verapaz.